I have always been a fan of a duck-egg hue but things have stepped up and now, just like Picasso, I’m going through my very own official Blue Period. I only want to ‘make’ in shades of blue and blue-green – just like Pablo. Sorry about that, my old friend Red. Six weeks of Complete Fail Cardigan knitting has been frogged and morphed into a light, drapey, cottony, spring-ish, (blue) shawl thing. The shawl, by the way, was a joy to knit. There’s some fancy-pants lace business, punctuated by lots of garter stitch and it’s a pattern that is entirely memorable and do-able – even with kids jumping all over you. 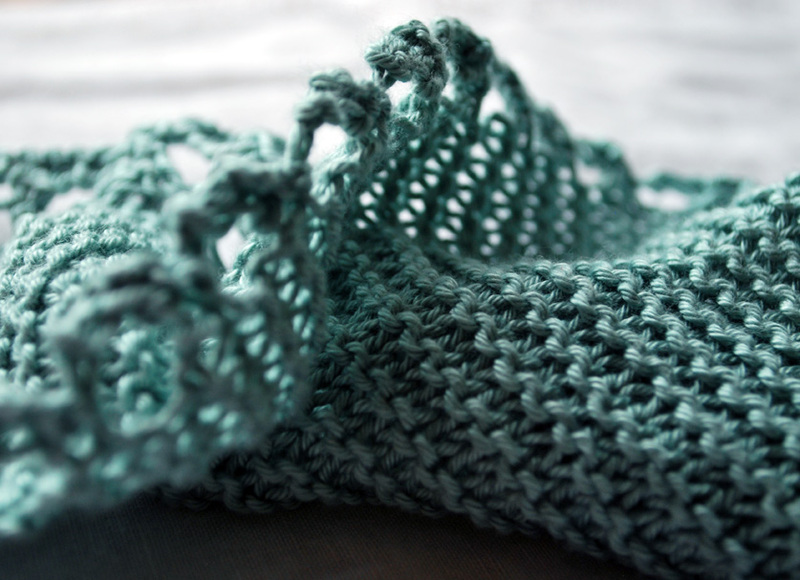 Less kid-jumping-all-over-you friendly, is the Simplicity Cardigan that I am now knitting in a positively irresistable, fragile-feeling, (blue) Tosh Lace 2ply. After all the knittery involved in the crafting of an entire 2ply cardigan, I will be an emphatically Weeping Woman if it’s another of the Complete Fail kind. PS. There has been household heated debate. The shawl is DEFINITELY blue. NOT greenish. Picasso didn’t have a Greenish Period. Part of our house is being pulled down. We're banished. It's OK though because we're in a caff with t'internet and I can ogle your exquisite shawl. Oh and I have an apple crumble tart thingy and unlimited tea. Sound! 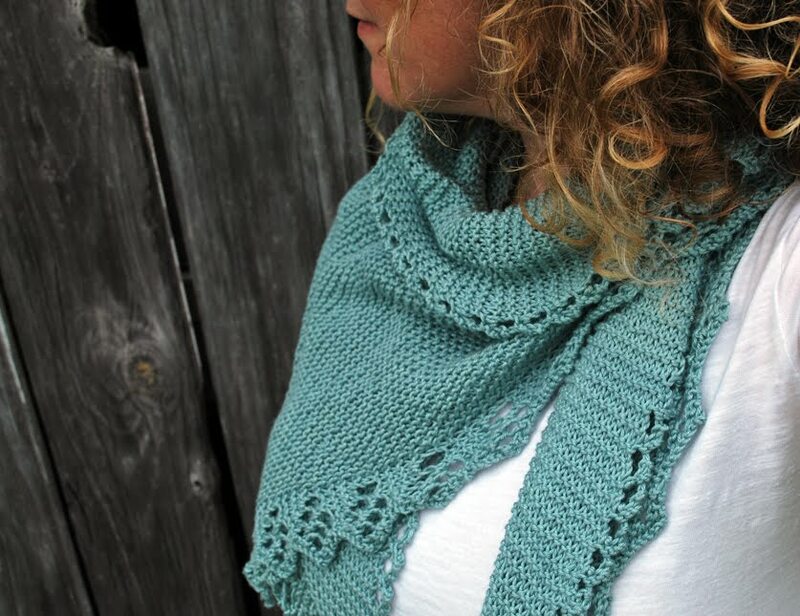 I don't really mind what the colour is called your shawl is just lovely ! Beautiful colour whatever you want to call it. I recently made some fingerless gloves for my 90 year old grandmother in-law.They were a winner. Or a cowl - todays shawl for the hip granny...? It's gorgeous, and I love the pretty trim! The shawl is gorgeous. You are my hero for even attempting to knit a grown up cardi in 2 ply! True story, every time I visit you make me giggle. Vive le bleu and all that it embodies. I love that color. I love that scarf/shawl. I would want to keep it too. 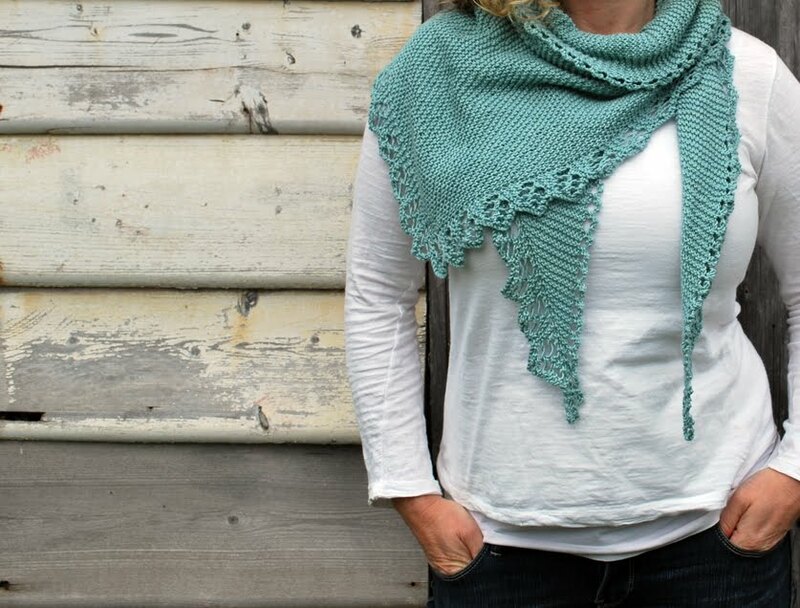 I think your Granny will absolutely love your shawl because her clever Grandaughter made it and I doubt many Granny's these days would have a Granddaughter that could even knit, let alone something that gorgeous! So I notice you've gone for a different pattern. Let me know if this one works because it looks gorgeous and I'll want to join you in knitting with spider-webbish yarn if it does. You know me...I've been in the blue period for a longggg time. Yep that shawl isn't going anywhere you can tell it has already settled in. Sorry bit useless in the alternative 90th birthday crafting idea department though. 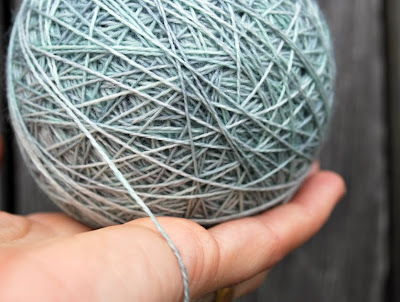 I wouldn't dream of knitting with 2ply yarn...it would take me a life time. duckegg goes perfectly with chocolate brown, btw. well if Granny doesn't like it, you should keep it, cos it looks wonderful on you! In terms of fabric, I've been in an orange period, my fave thing for linings. I have some laceweight, yours looks thicker. I'm trying to knit a cardi with it. It's alpaca and silk and about as daft a knitting idea I've ever had. Colour Daffy, very apt. I love that duck egg blue, greeny blues and bluey greens being my favourite colours. The shawl looks lovely on you but I am sure it would pass muster with a hip grandmother. I have a pinterest board for colour and the other day I noticed it is all yellowy greeny blue and aqua. hmmm. must be catching! It does look a little bit greenish... but that might just be my envy of its absolute beauty. 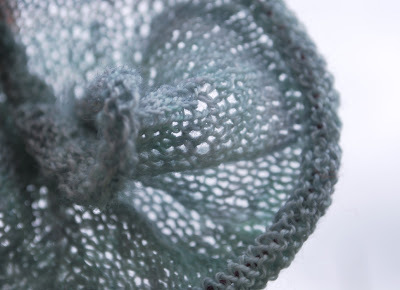 i think a hip and sprightly granny would love a blue / green shawl thing 'specially made by your clever hands. its vvery pretty what eer that colour is plus ido love a bit of light blue and red together! 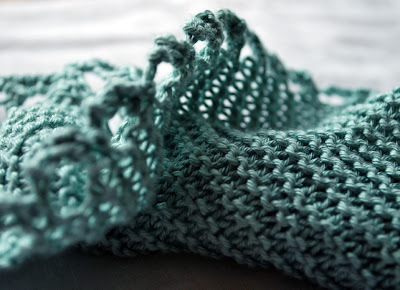 Everything you're knitting looks lovely, and I adore those shades of blue (definitely blue!). Robin's egg blue , says she firmly . Actually , it really doesn't matter what you call it .........it's beautiful ! And as for the gossamer wing cardi ? You'll look wonderful in it . And quite deservedly , too ! I hope you kept it. It is gorgeous and you wear it so well. definitely blue. no question. what silly would question that? hope pressie idea was found! shawls should NEVER be considered out of fashion. I am nowhere near 90 (but closer than you are, babe), but I tell my kids that my favorite present is a smarmy lovey-dovey note that tells me all your favorite memories about me and why I'm so wonderful. You can do that without worrying about the fail. The lace is lovely. And I'd say turquoise, which can go either way and is mystical. Why would you want to duplicate Picasso, anyway? I'm not sure he came to a good end. i think my whole life has been a blue period. it's my all time favorite color! love the scarf...your knitting looks so beautful...and wow i am impressed by your quilt!!! just popped in to make sure my feed was still working. ia actually crave your humourous little anecdotes and was thinking today, i haven't read anything amusing by tania in a little while. looks like you've been very busy enjoying real life. look forward to getting an update soon. xo m.